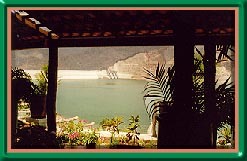 Aguamilpa, Mexico’s hottest new bass fishing lake opened in the fall of ’97. 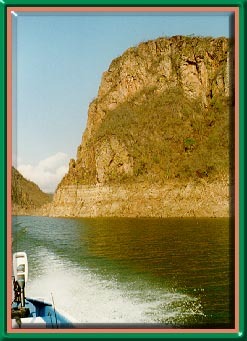 The 70,000 acre lake, one of the most accessible of Mexico’s hot bass fishing lakes, can be reached, by paved road, in 3 hours from either Guadalajara or Puerto Vallarta or by air to Tepic, Nayarit then a short 45 minute ride to the lodge. Stocked in 1992 with Florida strain largemouth bass the lake was protected from fishing until the fall of ’97. An ideal food base and ideal growing temperatures have made this a “Bass Fishing Paradise.” Lush tropical foliage covers the mountains that surround the lake making it one of Mexico’s most scenic. 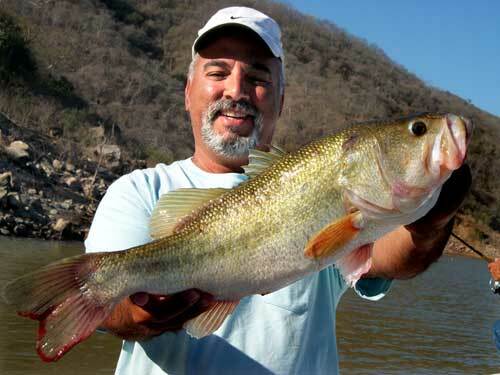 Aguamilpa lake is loaded with aggressive largemouth bass ranging in size from 2 1/2 to 10 pounds. On a recent preview trip a Texas outfitter’s wife caught over 50 healthy bass in less than 4 hours of fishing, the largest weighed over 6 pounds. The newly constructed lodge houses twenty anglers, and accommodations are first class. Situated on the side of a mountain, overlooking the lake, the lodge offers the angler a spectacular view of the lake and surrounding mountains while he relaxes and enjoys delicious meals and refreshing drinks. All rooms are air conditioned and have private baths. Our driver will meet you at the airport in Guadalajara or Puerto Vallarta and drive you to the lodge. The ride itself, is worth the trip. From Guadalajara you make all but the last 45 minutes on newly completed super highway. Along the route you’ll see several beautifully scenic mountain valleys, many of which contain small villages crowned with prominent Cathedral spires, for which the state of Jalisco is famous. One of the most famous, Tequila, for which the drink was named, is surrounded by thousands of fields of cactus from which the drink is made. From the beach resort city of Puerto Vallarta you wind along the coast before climbing into the tropical mountains toward Aguamilpa. Your trip will pass all too quickly as you take in the panoramic mountain vistas and pass more picturesque colonial villages. You may also fly in, by commercial airline to Tepic, just 45 minutes from the lake but we recommend either of the above trips over the convenience of Tepic. 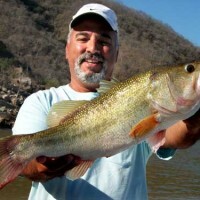 The bass fishing boats and motors are the best bass fishing rigs in Mexico. All are equipped with new or nearly new outboards, troll motors and swivel fishing seats. Book your reservations now. This lodge books quickly. For more detailed information and to make reservations contact us at, Bass Adventures at Lake Aguamilpa.